In under an hour’s drive from Carson Valley lies a most majestic, surprising and unpopulated mountain range: the Sweetwaters. This month we chose to hike up Sweetwater Canyon, just south of Smith Valley, off Hwy 338. The Sweetwater Canyon Road is clearly marked with a wooden BLM sign. We drove about two miles on this moderately traverseable dirt road until it became untraverseable by us in my Honda CRV (i.e. a creek was running across it!). We then headed up the canyon for the sweetest and most unexpected hike! 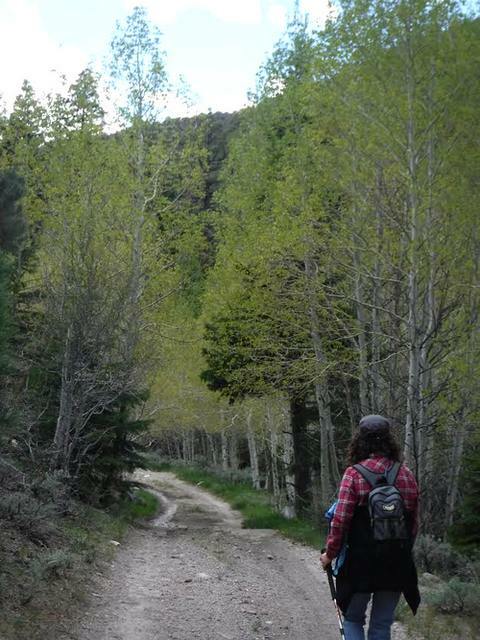 Beginning in drier desert terrain, the trail soon lead us through thick stands of aspen, enormous Ponderosa and Jeffrey Pines, and impressive displays of wildflowers. Jumping over the stream in a couple of places was fun and challenging (although it will likely soon get easier!) And finding a charming well-maintained cabin along the trail was a delightful suprise! We stopped to explore, read the log book, and play a quick game of horseshoes before heading up the trail. There is even a makeshift hot shower at this cabin, which can be used by the public as long as it is well cared-for. Our favorite part of the hike was rounding the last bend to watch a dramatic alpine wonderland unfold before our eyes, complete with jagged peaks and snowfields! 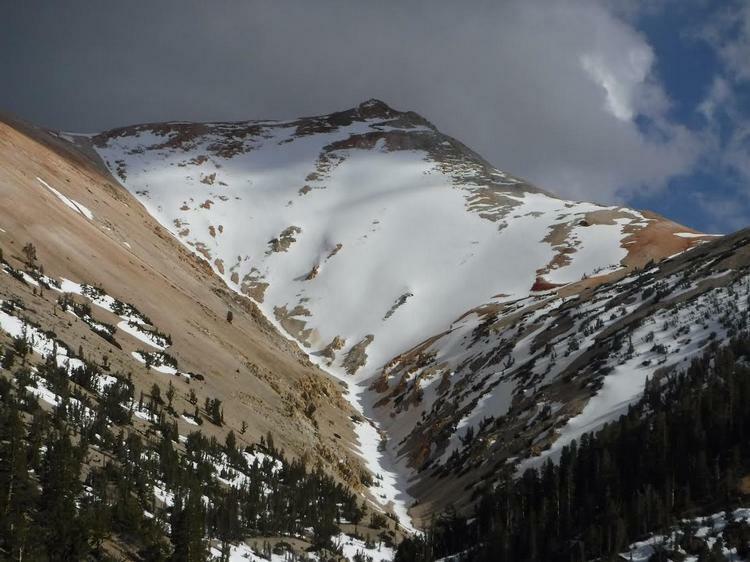 This dramatic alpine scenery surely rivals anything in the High Sierra. As usual, we did not encounter a single human soul on our 8-hour journey. (As for the wildlife, I am sad to report that I inadvertently reduced the population by one when I ran over a rabbit in the road on the way home.) As there is always the possibility of getting lost or stuck in the mud or snow, please be more responsible than we were and make sure to tell a friend where you are going and when to expect you back! It is hard to believe June is here already, and with it the biggest event of the year, the 106th Annual Carson Valley Days, June 9-12 at Lampe Park in Gardnerville. This beloved event features a carnival complete with nausea-inducing rides and food, old-fashioned games like greased pole climbing and eating contests, horseshoe and basketball tournaments, free live music throughout the weekend, a 5K/10K run, and the featured event, the Carson Valley Days Parade, on Saturday morning (this year’s theme is “A Pirate’s Life”). According to the Gardnerville Record-Courier, this event dates back to 1910, when over 700 Reno and Carson City residents came by Virginia and Truckee trains. It is now headed up by the Carson Valley Active 2030 Club, an inspirational group of rowdy, fun-loving adults dedicated to improving their community. There are so many things that make me happy to live in the Carson Valley and feel privileged to have raised a family here. 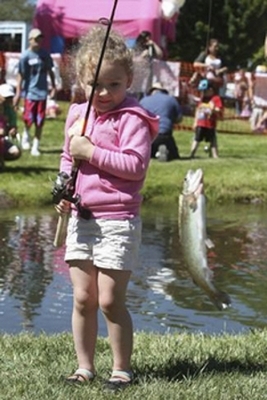 The Annual Kids’ Fishing Derby at Lampe Park is one of them. All kids age 3 to 12 are invited to participate for free; they can even borrow gear if they have none. The small “Willow Creek” is amply stocked, and there are lots of kindly volunteers present to ensure that every kid has a fun and successful experience. So even if fishing isn’t your thing, your kids will get “hooked” on the sport! Just be sure to sign up in advance (fills up fast) and buy some raffle tickets (great prizes) to support this free, all-volunteer event. If fresh organic produce, free live music, food and craft booths, and strolling around on a warm summer night is your thing, you will be thrilled to know that the Minden Farmer’s Markets are back, everyTuesday evening from 4-8 on Esmeralda Street near the CVIC Hall. The Wednesday morning market is also back from 9-1 with a move from Lampe Park to the Episcopal Church on Esmeralda. Concerts in the Park is featuring Nathan Owens Motown and Soul Review on June 17 at 6:30 at Minden Park, and Movies in the Park starts back up with Night at the Museum on June 24 at Heritage Park (starts at dusk). Both events are completely free and wildly popular. Something I am really excited for this year is the Genoa Concerts on the Green series, starting June 12 from 5-7 pm at Genoa Park. I like the feel of the smaller, old-fashioned venue (bring a picnic basket and blanket) and the homegrown music from the likes of the Sagebrush Rebels and the Quake City Jug Band.